Bowling Green, KY and Justine Lewis Jones of Salem, OR. Settled: Halsey, Linn Co. OR. John Engard Roberts was from Illinois. He was born in Cass County, still today a small county with less than 14,000 population. The family home place was near Virginia, IL, the county seat. His parents were C. W. and Mary Roberts. John found Mary Jane Linville in adjoining Pike County and married her in 1856. She was a Kentucky maiden. Mr. Roberts, according to his obituary, was a schoolteacher for 12 years. At the age of 29 he was ordained to the ministry by James Burbridge and Hardin Goodin at the Christian Church in Martinsburg, Illinois. Historian Nathaniel S. Haynes writing in his History of the Disciples in Illinois described the Pike County church as "An old church of good but conservative people." 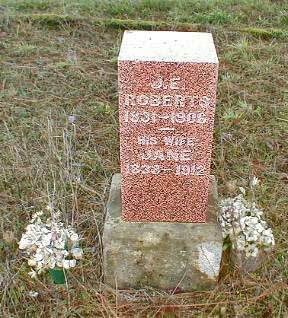 The Roberts had five sons and five daughters, the oldest being Mary, born in 1857. She came west with her parents and married John Henry Lewis of the Lewisville, Polk County, Oregon clan. While in the mid-west, John was known by the middle name of Enyart, the maiden name of his grandmother. But when he came west, that was changed to Engard. When the Roberts family group decided to settle in Oregon, they choose a trip around Cape Horn. Their trip began in Pike County, Illinois and ended in Oregon in 1872. We suppose they traveled south on the Mississippi to New Orleans and then took an ocean-going ship around the tip of South America. The travelers included John and Mary Jane and his Kentucky-born parents, Cornelius and Mary (Polly) Roberts. There were other family members on the ship as well. The family had migrated to Illinois from Kentucky where they had lived very close to John Mulkey. Without a doubt, they had been influenced by the preaching of John Mulkey and the many other preachers that accepted the principle of being Christians only. There is a profile of John Mulkey. 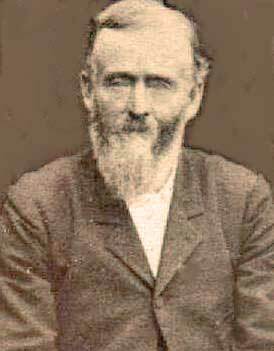 John Roberts preached for the Halsey Church in the 1870s and the Aumsville Church by 1881. The Aumsville church was an outgrowth of the old Mill Creek church of an earlier time. He remained at Aumsville for more than twenty years. This in itself was remarkable in an era when churches contracted preachers for one-year terms. Additionally, he preached in Lane, Linn, Polk and Yamhill counties. Aumsville, July 18. -- Assisted in the organization of a Church of Christ at Abaqua, Marion Co., on last Lord's day, with 9 members. Dr. L. L. Rowland was chosen elder, and Bro. F. M. Shepard as deacon. This church is a new field, where but little preaching has been done by our brethren. I think good will be the result. I will preach for the church at that point once month, for a while at least. In the highest location in the Aumsville Cemetery. Aumsville, December 12. -- We have but a few preachers in this valley, and hence but few protracted meetings. I am preaching for four congregations, one-fourth of my time at each one. The churches that I labor for are doing tolerably well considering the amount of work done. We need a few good revival preachers that are not afraid to work, and they would be supported. A strange brother from the East is holding a protracted meeting for the church at Stayton. His name is Fey. May the Lord send us more laborers in the vineyard. Both John and Mary Jane are buried at the Aumsville Cemetery. The older marker has been replaced with a newer one.